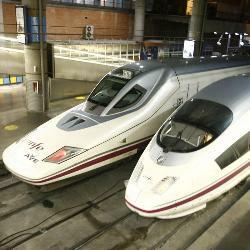 Starting this week, RENFE, the Spanish railroad company, is increasing the frequency of its high-speed train service (AVE) between Barcelona and Madrid by one third. Instead of the previous 19-20 scheduled trains, there will be up to 26 daily departures in each direction. Two of the newly added trains will be direct, making no stops, the others - local, extending the existing Madrid - Zaragoza line service. AVE trains. Photo: europa press. Thursday is now the day with the most scheduled departures (26). On Mondays and Wednesdays there will be 25 trains in each direction and on Tuesdays, Fridays and Sundays - 24. The AVE service between the two cities is increasingly popular: more than a million passengers used it during the first six months of 2008 (which is almost double last year’s passenger load). One of the biggest selling points of AVE trains is their punctuality: over 99% arrive on time. This compares favorably to airlines who can only claim that about 88% of their flights.